This really is an exciting time for planet hunters. A few weeks ago, the discovery of a system with as many as 7 planets was announced around HD 10180. Now, it’s been announced that a planet around another star, Gliese 581,* is perfectly located in the star’s habitable zone. The audacious claim that this planet, Gliese 581g, is certain to host life has even been made! Now, I wouldn’t go so far as to say that this planet is certain to host life. It seems remarkably premature to say such a thing, if I’m honest. All the same, the prospects here are really quite exciting. Gliese 581g is expected to have a mass of around 3.1 – 4.3 Earth masses. Assuming a similar composition to Earth, it would have a radius between 1.2 and 1.5 times that of Earth. A little bigger than Earth, then, with gravity enough to make a human a bit out of breath after climbing the stairs. There is one thing, though, which makes this brave new world very un-earthlike indeed. Gliese 581, you see, is a red dwarf. Red dwarfs are still believed to be capable of supporting life, although others believe that a different chemistry around red dwarfs may render them incapable of evolving life in the first place. Perhaps the most unusual thing about Gliese 581, however, is the fact that it’s tidally locked. Gliese 581 is only a red dwarf, putting out a relatively feeble 0.2% of the light and heat that the Sun produces. The habitable zone around Gliese 581, then, is much closer than the zone Earth sits in around the Sun. 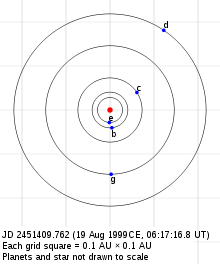 So close to it’s parent star (only around 0.15 AU away), the planet Gliese 581g experiences gravitational forces so different on its nearside and its farside, that it simply cannot rotate. Just like the Moon orbiting Earth, this planet has once side always facing away from its parent. This also means that the dayside of this planet will be scorchingly hot, while the night side will be perpetually frozen solid. Let’s face it, the idea of a planet which is frozen solid on one side, but with boiling oceans on the other side does sound like it may be a problem for life to exist on it. ** Mind you, through a combination of geothermal energy and a nice dense atmosphere, that may not be as much of a problem as it sounds. Though the jury is still out on whether it’s even possible, the idea of life on such troublesome tidally locked worlds like these has been explored before in some detail. For instance, in 2005, National Geographic aired a short two episode series called Alien Worlds. The series was scientific in some ways, and fanciful in others, but proved overall to be quite insightful. Actually, I was rather disappointed that they never made any more episodes. 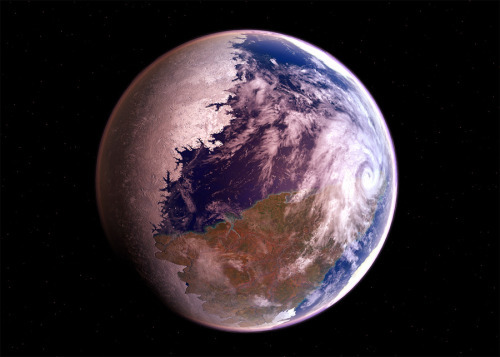 One of the possible planets they explored in the series was a tidally locked planet around a red dwarf star, dubbed “Aurelia.” With a frozen darkside and a perpetual storm on the dayside, Aurelia seems like a fairly good idea for what Gliese 581g could potentially be like. If the planet is capable of supporting life, it would be tied to the region near where the terminator — the region where day meets night. Could life adapt to such an unusual environment? In all honesty, it’s not as if life hasn’t adapted to more unusual environments here on Earth. On a final note, Gliese 581 is likely to be a little too massive to be plagued by the intense stellar flares that many red dwarfs produce. An absence of such flares would be a major plus to any potential of life existing there. For habitability, red dwarfs have a tendancy to be their own worst enemies. Life, however, has shown on Earth that once it has a foothold, it can be remarkably tenacious and adaptable. Perhaps the real question isn’t whether life could survive under a red dwarf sun. Perhaps the real question should be whether life could evolve there in the first place! *Some people may remember that Gliese 581c a planet that a Ukrainian radio telescope transmitted a message to a couple of years ago. A message from users of Bebo on the internet! **Well ok, maybe not boiling. But that temperature gradient’s got to be nasty, right? This entry was posted in astrobiology, Imported from Livejournal and tagged planets, stars. Bookmark the permalink.